Many New Jersey pond owners are wondering what to do for a koi pond or water garden during Spring, around this time of Winter. As grey Winter days lengthen and brighten with most of the cold solidly behind us, New Jersey pond keepers start thinking toward Spring. It starts to become easy to visualize our frozen snowy ponds popping to life with colorful koi swirling below the clear water, bursts of colorful blooms all around the pond, and the tranquil sound of the waterfall cascading into the pond again, distorting the reflections of our backyards on the surface of the pond. Ponds, like so many things during Spring time, become a priority in preparing for the outdoor living season. Koi ponds and water gardens, are always the centerpiece of every landscape design, so it is important to have them looking good and ready for another year. So what are some of the things that should be done for a koi pond water garden during Spring? 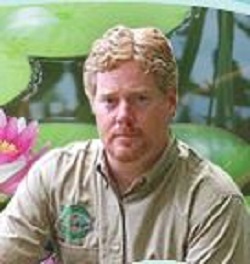 This question is answered by Mike Gannon, a New Jersey based pond professional and owner of Full Service Aquatics (www.fullserviceaquatics.com). 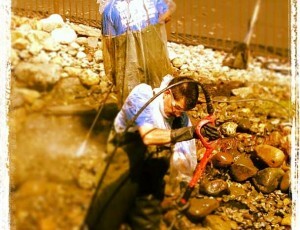 Full Service Aquatics offers a variety of professional pond cleaning, maintenance and repair services for New Jersey pond keepers. When Spring time hits in New Jersey, having a day off is a big commodity! A professional pond cleaning service might be just the thing but for the DIY’er the 3 easy steps will get your pond into good shape and the outdoor living season that much closer to reality. Enjoy the pond keeping experience in 2017 and share it with family and friends. Call today for pond design, installation, renovation, maintenance, leak repair, emergency issues. I have an 80 ft pond on my property with frogs and some koi a great blue heron cleaned house last month. Tried everything to stop it but nothing worked, found a product that has kept the bird away for three days so I am keeping watch and if successful for a week I will report back. As we all know these are very persistent characters , and I hope this works.